NFL Forum :: - GDT: 49ers (4-2) at Titans (3-3), Locker Starting! GDT: 49ers (4-2) at Titans (3-3), Locker Starting! Titans, Because I'm Optimistic To A Fault. Tie, I'm Not Sure What To Say About This Option. Let Me Wait Until The End Of The Game Then I'll Vote For The Winner. This Poll Option Is Kind Of Heavy Handed. Posted: Tue Oct 15, 2013 1:43 am Post subject: GDT: 49ers (4-2) at Titans (3-3), Locker Starting! Time: Sunday shortly after Seahawks game. A man who will do anything to win and you'll just have to learn to accept that. 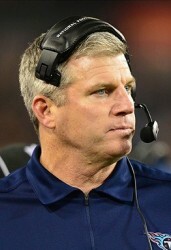 Mike Munchak has a pained look on his face as he paces around the locker room. Players are huddled waiting for Munchak to deliver the post game speech. Chris Johnson asks a question, Munchak looks frustrated with Johnson. Munchak: Dammit Chris this can't keep happening, you need to bring your pen and paper so I can understand you or else I can't address any issues you have. Does anyone have any paper for Chris? Zach Brown: Well actually coach he wrote this speech just now, he said he put a lot of heart into it and would appreciate it if you read it. Munchak (reading off Johnsons post game speech): Damn, mang we had the game and we let them off the hook so crown their innapropros/removed. Munchak: Chris you know plagiarism is a crime right? But then again the last time you flexed your creative muscle you gave the world Hands on Deck. Munchak: Well that's that. Your all excused except for you Fitzpatrick... I need a word with you. Everyone clears the room as a single tear sheds down for Fitzpatrick you see since his Elementary days Fitzpatrick has been the perfect student, athlete, and son. Doing nothing to receive discipline so receiving his first trip to the principles office so to speak has rattled him to the point of tears. Munchak begins to speak and Fitzpatrick turns his head thinking it will stop coach from seeing him cry. Munchak: Now son I'm not going to sugarcoat it you played like crap, absolute crap. You're absolutely stinking up the joint. Honestly you make Matt Schaub look like based god. That's not even the start of it I see that Roger Goodell has blocked you on facebook. He seems to be hell bent on seeing you benched this week. Let me see if I can pull up the email. Munchak pulls out his phone and begins to read off the email sent by Goodell. Munchak: I usually don't request these kind of things and I might be out of line but you can't start Fitzpatrick it's just bad for buisness. I've worked hard to build the NFL into a high scoring fun to watch sport and watching Fitzpatrick go three and out every drive is the exact opposite of fun. If todays NFL quarterbacks are like high schoolers running the mile than Fitzpatrick is the fat kid who smokes who walks three miles than argues he already did 4 laps to the gym teacher. Fitzpatrick: Ouch that cut me deep. Munchak: I'm feeling a lot of pressure to bench you this week but there is a way you can avoid that shame... Intel. Fitzpatrick: Ohhhhh no please coach no. Munchak: I know intel isn't fun but I'm desperate for a win and this is the only way. This is your destiny Fitz, do it for your teammates. Fitzpatrick: Fine I'll get the scoop! Act 1 finished: Sunday Before the Game, Fitzpatricks Mission. Fitzpatrick has a small bag labeled intel as he heads into Munchak's office and he dumps the contents onto the desk. Munchak: So what did we get? Fitzpatrick: Well I combed through Kaep's house and I found Mighty Wings, his 4rth grade report card, 50 Shades of Gray, and a postcard from China it's him at the Great Wall and it says I miss you this much. I'm not sure how any of this helps though. Munchak: To beat the enemy you have to know them better than they know themselves. Munchak opens up the 4rth grade report card. Munchak: I see a C in English, D in Math, A+ in Gym, B in Science, and C in Psychology. The math grade is very interesting he obviously doesn't have a grasp on angles, I'll have to give this to Williams he can throw some exotic blitzes to take advantage of this. Now about this book I'll just have to confiscate it. Munchak puts the book on his shelf by the classics he's collected. Munchak: Good job Fitz, you've exceeded my expectations not only have you given us an edge on the opponent but you've also given me excellent reading material. I've never heard of this book but I can tell from the title that it must be an introspective hard hitting book. I have to read this right now it'll provide some excellent material for a post game speech. Rich Eisen: We have received breaking news here on NFL Network, well multiple reports are breaking out at once. 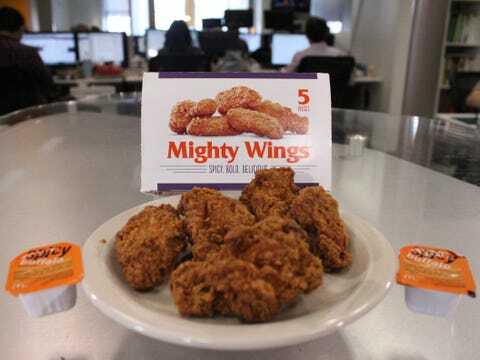 We have a new rule that will have huge implications on the game and we'll get to that at the top of the hour but first Mighty Wings a delightful taste sensation that are so good it'll drive some... to steal. Quarterback Colin Kaepernick after a normal practice noticed something out of the ordinary, his Mighty Wings were gone. Kaepernick released this statement. Rich Eisen (reading Kaepernicks statement): This news is very distressing on a number of levels firstly because I could've sworn I locked all the doors and windows before I left and the cops said that there were no signs of forced entry. Secondly because the key I leave under the mat is gone, I don't get what could've happened to it, it's a windy day but I believe that the mat would've blown it away but then again when I'm in a hurry I drop the key on top of the mat which may have happened today but my memories not the best so my wind hypothesis actually still stands. The fact that the Mighty Wings were stolen also rustles my jimmies because it could mean the end of the world as we know it. Rich Eisen: The SFPD have also released a statement saying that, Kaepernick has informed us of the importance of these Might Wings and rest assured that not only are we using all of our resources but we are acting in unison with other police departments, the FBI, and the Men in Black. We are aware that this is a race against time and we are working our fastest to apprehend the suspect. Rich Eisen: We'll have more on this interesting development as it unfolds and now to Michael Irvin for his NFC East predictions. Reserved For Season Facts, Odd Facts, Keys To Victory, ETC. wth did I just read? Wow.. Victor Cruz Pun this is different. You maybe on to something, I hope it works this week. I don't care who wins, but I dislike very much how overrated the 49ers are around this forum and talking heads. Hopefully both teams play so hard that they don't have any will left to continue the season causing both teams to go 0-9. Btw, I don't know if I mentioned it on this forum, but I had the Titans making the playoffs before the season. I don't trust Fitz to not screw the pooch. BTW the touchdown comes off our defense. I have faith in this team to win this game. We need this game and I don't think the defense will let us lose. God I can't wait to be proven wrong by Fitzpatrick. I think we stand a decent chance of taking this game. Kap has been struggling as of late and Aldon Smith still isn't back in the lineup. I see a lot of George Wilson snaps this week covering Vernon Davis. Gotta make sure Fitz doesn't take any stupid chances and use his noodle arm to try to take a deep shot. Keep stuff short and simple. Get the ball into KW's hands and use some screens to KW/CJ to slow down the pass rush. Our offense has been struggling sure, but look at the defenses we have played... as of last week. We have played 5 of the top 6 defenses already this season and 2 of them with Fitztragic at the helm. Not to mention this week we play the #9 D in San Fran. If we can pull this game off I love our chances the rest of the season with Jake back. The rest of the games after the bye. And with Peyton headed up to Indy to beat up on the Colts with his buddy Von Miller back in the line-up I could very much see us tied for the AFCS going into the bye and going 7-2 the rest of the way. I think 10-6 should get us into the playoffs but I'd feel a heck of a lot more confident with 11-5. This wont help much... but hey..